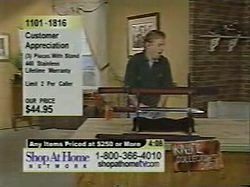 QVC has lately been trying its hardest to appeal to the younger crowds through the gradually increasing use of leetspeak and violence. "Oh, that hurt! Oh, that hurt big time!" For those without comedic tastes, the so-called experts at Wikipedia have an article about QVC. Started in 1973, QVC, or the "Quickly Vending Crap" Channel, is a home-shopping televisual show aimed at lonely thirty-somethings who still live with their parents, teenage mothers, and old ladies who smell of cats and werther's originals. When the German Sausage Channel went into receivership in 1972, television executives decided that they had to replace the channel with another, otherwise the balance between good and evil would shift drastically and possibly bring about the end of the world, maybe. Grasping at straws and running out of time, things looked grim for the executives, when one of the interns suddenly had an amazing idea. He proposed a television channel where idiots viewers could buy items that no sane person could possibly want. Others questioned exactly where he intended to buy all these goods, which is when he told them the genius of his idea. He drove home, filled up his car with all the crap out of his garage he didn't want and drove it back to the executives' room, and piled it on the table. 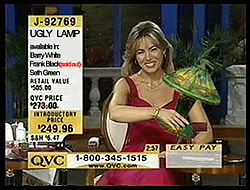 The intern in question was none other than Michael Jordan, and at that moment QVC was born. Pammy Pissknickers doll with realistic nappy rash, and refillable urine pouch. Official Abba disco ball and moustache kit. Diamonique hunting knife with realistic sounds and flashing lights. Transsexuals. Plastic robots that change gender when wet. Pong! The Movie - official film cells. 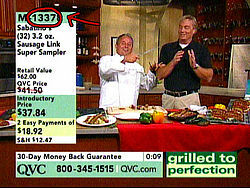 QVC is part of Uncyclopedia's series on Mass Media. This page was last edited on 30 May 2012, at 06:41.